Today, “vehicle connectivity” is more than just a buzzword – in fact, it’s poised to be policy. On May 14, the Transportation Secretary announced a plan to fast track a rule requiring all new cars to include vehicle-to-vehicle communication. The rule will be reviewed by the end of 2015, but the auto industry is already well on its way. Propelled forward by advancements in the amount of software a vehicle can process, the potential for connectivity has begun to capture the imagination of the largest manufacturers. In addition to making life more convenient, the connected car is also poised to make a larger positive impact. As vehicles learn to “talk,” their conversations are becoming increasingly meaningful, and often unexpected. By communicating with the grid, interfacing with our homes and sending data to the cloud, our cars can help enable efficient energy use, address major mobility challenges and more. The U.S. energy system is becoming more distributed as we move away from large-scale fossil fuel-powered plants. While this shift will certainly be more sustainable in the long run, it could also lead to some short-term volatility (after all, we can’t always control when the sun will shine, or when the wind will blow). For that reason, we need our largest plug-in devices to start talking – and electric vehicles are a great place to start. In 2014, the Electric Power Research Institute (EPRI) brought together seven global automakers and U.S. utility companies to develop a software platform that improves communication between EVs and the grid. During peak hours, the platform can be used to send a request to EVs to stop charging temporarily, releasing pressure on an overloaded grid. Once implemented broadly, participating utilities will be able to offer financial incentives to drivers who opt into this communication system – similar to the way customers can agree to flex their air conditioning for lower rates in some areas. Data from Ford Motor Co. has shown that its customers have driven more than 360 million electric miles. As the trend toward vehicle electrification continues, cars and homes are increasingly relying on the same power source: electricity. Noting this trend, automakers are starting to think about how vehicle-to-home communication can make our lives more sustainable. 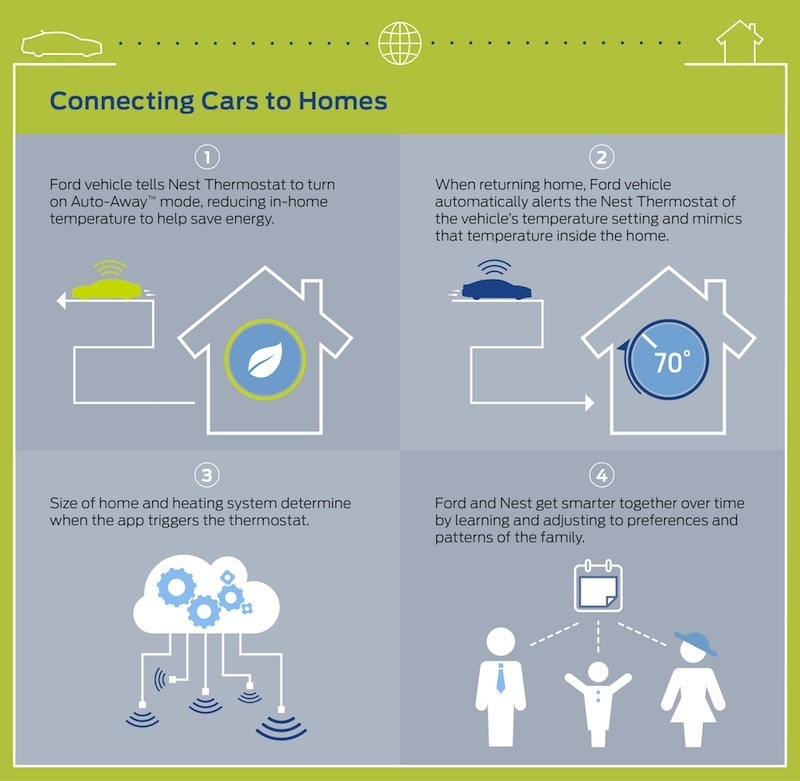 In 2013, Ford launched MyEnergi Lifestyle (MEL): a collaboration between Nest, Eaton, SunPower, Whirlpool and Infineon designed to optimize energy use in a home setting and promote the use of renewable energy. By using cloud-based automation to switch a bulk of energy consumption to off-peak hours – including EV charging – the program has the potential to cut monthly bills by more than 60 percent. To this day, MEL continues to progress – in fact, at CES Asia this week, Ford announced that it has just been adapted for the Chinese lifestyle. Across the globe, these types of cross-industry conversations are driving smarter, more automated energy use and less unnecessary pollution. And beyond electricity, there are implications for security, safety, home temperature control and more. Cars are intimately connected to cities. They move through crowded streets, maneuver across packed parking lots, circle around busy blocks, and weave around bicyclists and pedestrians. All of these touch-points offer an opportunity to collect valuable information that could help city planners reduce gridlock and improve mobility – and make life less painful for urban drivers. But with so many touch-points, where should we start? One option is to install more sensors in cities by building infrastructure form the ground up. However, this type of project can be costly, as a single sensor-equipped parking space can cost around $500. By leveraging existing vehicle technology, on the other hand, automakers can collect anonymous information that will improve the driver experience, without a massive investment. In other words, the talking becomes quite a bit easier. Ford’s Parking Spotter app is a great example of this. Using GPS mapping and a national database of all existing parking spaces, Ford is able to detect when a vehicle enters into a parking lot or a parking space, which activates vehicle-mounted sensors. Information about open spaces is then sent to a cloud database, contributing to a near real-time parking map. Using Parking Spotter, drivers can get a better sense of space availability before they begin circling the block. While convenience may be the main draw, the environmental implications can’t be ignored. In fact, a UCLA study found that drivers in a 15-block area burned 47,000 gallons of gas annually while looking for parking. In short, there’s a lot to be gained. It’s been said that one conversation can change everything. As more entities enter the dialogue between vehicles and the world around us – and as government shows increasing support for this type of innovation – it’s exciting to think about where the conversation will lead. Mike Tinskey leads Ford Motor Company’s sustainability activities for electric vehicles, energy and infrastructure at a global scale. His focus is to develop and implement business models, partnerships and technologies to push forward the success of the company’s sustainability plans. He has spearheaded collaborations with a range of innovative groups including SunPower Corporation, Nest, KB Home, the Georgia Institute of Technology, the Electric Power Research Institute (EPRI) and more.